My daughter is obsessed with slime videos and has been asking to make it for such a long time. I finally searched How to Make Slime and realized it was SO easy! Especially since Elmer's makes Glow in the Dark glue! 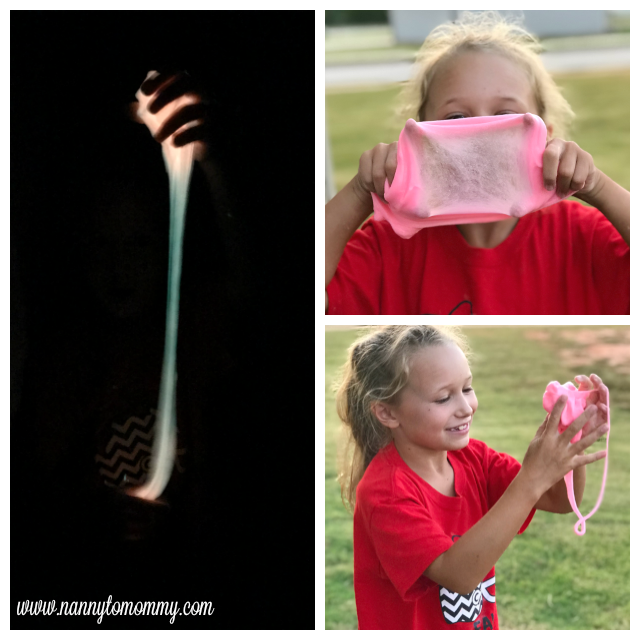 So since we had so much and it is still all the craze, I decided to share an easy Glow in the Dark Slime Recipe without Borax! 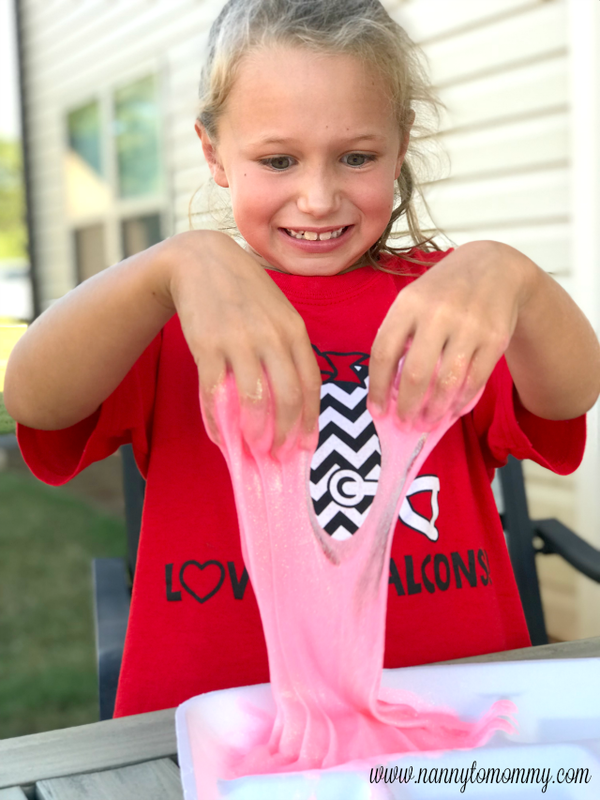 Make sure to let me know in the comments if your kiddos like slime as much as mine do! And if you have any tips or tricks of making your own slime since we are still very new to the process. My daughter is seven years old (will be eight in December). This recipe was very easy for her to do by herself even though I monitored everything closely. I also set everything up. She has watched many videos on hoe to make slime so I think that helped a lot. 2. Pour out the entire contents of glue into a bowl. 3. Add 1/2 tsp. of baking soda and mix thoroughly. 4. Add 1 TBSP of contact lens solution. 5. Mix until mixture gets harder to mix and slime begins to form. 6. Take the slime out and begin kneading with both of your hands. Trouble Shooting: It was still super sticky. There were some solutions I found online to add a water/baking soda mixture and another that was suggested by Elmer's was to add more contact solution, but what we found worked was to just keep kneading in more baking soda until you get the right consistency. We also didn't care for the smell very much, so we added some essential oils - peppermint. My daughter loved the smell after that. My daughter must watch too many YouTube videos of kids making slime because she knew they if she just kept kneading (and even said that word haha) that it would become less sticky. My daughter is becoming a little pro at making slime and we definitely have plans to make different varieties including foam and glitter slime as well. I have seen that you can also make glow in the dark slime with highlighters, but I personally didn't like exposing my daughter to those chemicals on her hands since it also has a tendency to stain. My daughter was over the moon to make slime. And it ended up being a very easy activity for us to do together. There are containers that you can buy to store your slime when you are done, but we just used a regular snack sized Ziploc baggie. Slime supplies make great gift ideas, I think you could make a gift basket with all the ingredients including directions and kids would LOVE it! And it really was a fun activity that we got to do together. I also think the glow-in-the-dark makes it spooky for Halloween. Have you ever made slime? What are your favorite things to add? New to making slime? How did yours turn out? What a great idea! Showing this to my daughter who is Stranger Things obsessed! How fun! What a great DIY for kids! 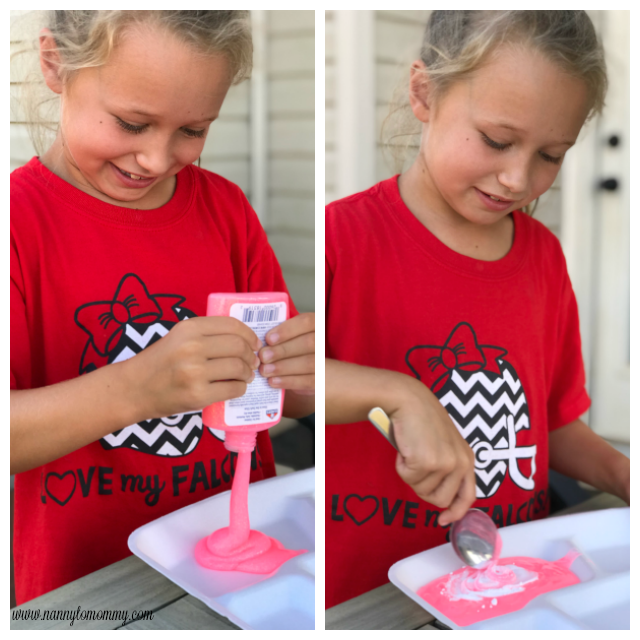 I love this slime, never thought of glow in the dark slime, the best part is her expression - half 'wow this is fun' half - 'hmm a little gross' so cute! My granddaughter has been wanting to make slime. This looks like it wouldn't be too hard to do. Never made slime before but looks easy. My daughter would have so much fun. This looks so fun and I know my children would really enjoy making it! I’m new to MIX and I was just getting used to StumbleUpon! I added this to MIX. I thought this slime bit was just a temporary fad, but I guess not. My grandkids now want to make this recipe. They like the Glow-in-the-dark recipe. I didn’t know there was glow-in-the-dark glue. It’s actually pretty! I agree with you about the smell no matter which glue you use! Thank you for that awesome idea! I’ll have to tell the younger grandkids that you don’t eat it! I love your daughter’s face in that one picture! This is pin worthy! Thank you for sharing! I haven't made the glow in the dark slime with my granddaughters yet. I know they will really like this slime. My children would absolutely love doing this! Lol, kids definitely like slime. Glow in the dark slime definitely takes it up a notch!